I have today sent off my letters to the Prime Minister and the Metropolitan Police Commissioner. I set up my forum with serious intent. I wanted my forum to put together evidence about what really happened to Madeleine. Over the years, together, we have done just that. When Operation Grange was set up in May 2011, many of us had high hopes for it. I think it’s fair to say that most of us now feel that those hopes have been dashed. I’d like to thank first of all those who helped me compile this letter, and all of you who in recent weeks have made suggestions about the content, even those who noticed a minor typo or a failure to close some inverted commas. I hope I’ve done justice to all your suggestions. I’m especially pleased to be able to say that my letter has been examined by some of those who have put the most work into unravelling this mystery and they have pronounced it accurate in its details and very much to the point. And that point is that Operation Grange does not seem to have been a genuine search for the truth. I also want to pay tribute to many others whose work has contributed to this letter. By that I mean people like Nigel Moore and ‘pamalam’ who have for nearly 10 years run the mccannfiles and mccannpjfiles sites. I also mean Joana Morais and the many Portuguese helpers who voluntarily translated the Portuguese police files on the case, and many other documents. And I also mean every single individual anywhere who has helped to get us nearer to the truth. I’ve done my bit. Now can you all help me please? Add a link to this thread, of course! I’ll be arranging to send copies of this to various people over the next few weeks. Please share what you’ve done, or post further suggestions, on this thread. “The ‘investigative review’ will be conducted with transparency, openness and thoroughness…” . The photographic evidence of Madeleine’s presence in Praia da Luz on the McCanns’ holiday is confined to just five photographs. Three of those five are genuine photographs taken on the first day of their holiday, Saturday 28 April. A fourth, allegedly showing Madeleine holding tennis balls on a tennis court in Praia da Luz, has been claimed to have been taken by two different people and on two different days. There are other aspects of that photograph that also cast doubt as to its true provenance. Second, there is the strange and striking correlation of two reports, made respectively by Jane Tanner and Martin Smith, alleging they had seen a man carrying a young child on the night of 3 May 2007, with a third report by a Spanish ex-pat living in Germany Nuno Lourenco, in which he alleged that a Portuguese holidaymaker, Wojchiech Krokowski, had tried to kidnap his own daughter on Sunday 29 April. Nuno Lourenco’s statement can be shown to be demonstrably false, yet his description of Krokowski is matched in almost every detail by the descriptions of Jane Tanner and Martin Smith. In particular, each of the three uses this meaningless phrase to describe the man: “He didn’t look like a tourist”. These facts, prima facie, suggest collusion to promote Krokowski as the likely abductor. This alleged collusion is clearly a matter which should have been addressed by Operation Grange, but there is no evidence that it has been. “Halligen has a degree in electronics [and] worked on the fringes of the intelligence community...After leaving the AEA, Halligen set up Red Defence International Ltd as an international security and political risk company, advising clients on the risks involved in investing and doing business in unstable, war-torn and corrupt countries…In 2006, he struck gold when hired by Trafigura, the Dutch commodities trading company. Executives were imprisoned in the Ivory Coast after toxic waste was dumped in landfills near its biggest city Abidjan. Trafigura was blamed and hired Red Defence International at vast expense to help with the negotiations to release its executives. A Falcon business jet was rented for several months during the operation and it was Halligen’s first taste of the good life. The case only ended when Trafigura paid $197 million to the government of the Ivory Coast to secure the release of the prisoners. Halligen made a fortune from Trafigura and was suddenly flying everywhere first-class, staying at the Lansborough and Stafford hotels in London and The Willard hotel in Washington DC for months at a time. In 2007 he set up Oakley International Group and registered at the offices of the prestigious law firm Patton Boggs, in Washington DC, as an international security company. He was now strutting the stage as a self-proclaimed international spy expert and joined the Special Forces Club in Knightsbridge, where he met Exton”. “During the Madeleine investigation, Halligen spent vast amounts of time in the HeyJo bar in the basement of the Abracadabra Club near his Jermyn Street office. Armed with a clutch of unregistered mobile phones and a Blackberry, the bar was in effect his office. ‘He was there virtually the whole day,’ a former colleague told the Evening Standard: ‘He had an amazing tolerance for alcohol…When not imbibing in St James’s, Halligen was in the United States, trying to drum up investors for Oakley International. On 15 August 2008, at the height of the McCann investigation crisis, he persuaded Andre Hollis, a former US Drug enforcement agency official, to write out an $80,000 cheque to Oakley in return for a ten per cent share-holding. The money was then transferred into the private accounts of Halligen and his girlfriend Shirin Trachiotis to finance a holiday in Italy, according to Hollis. In a $6 million lawsuit filed in Fairfax County, Virginia, Hollis alleges that Halligen ‘received monies for Oakley’s services rendered and deposited the same into his personal accounts’ and ‘repeatedly and systematically depleted funds from Oakley’s bank accounts for inappropriate personal expenses’. Hollis was not the only victim. Mark Aspinall, a respected lawyer who worked closely with Halligen, invested £500,000 in Oakley and lost the lot. Earlier this year he filed a lawsuit in Washington DC against Halligen claiming $1.4 million in damages. The finances of Oakley International are in chaos and numerous employees, specialist consultants and contractors have not been paid. Some of them now face financial ruin”. I've now sent my letter and Appendix by email to my own MP aswell as other MP's in my immediate area and I've also sent it by email to Jeremy Corbyn and Amber Rudd. Thank you trotter1...I was thinking of tweeting him too. He did a podcast about Madeleine some time ago. Perhaps he should do another one now he's been armed with some more info! I love his podcasts and regularly share them on my facebewk thingy. Jill's letter has so much information in it that it deserves to be posted in as many places and formats as possible. 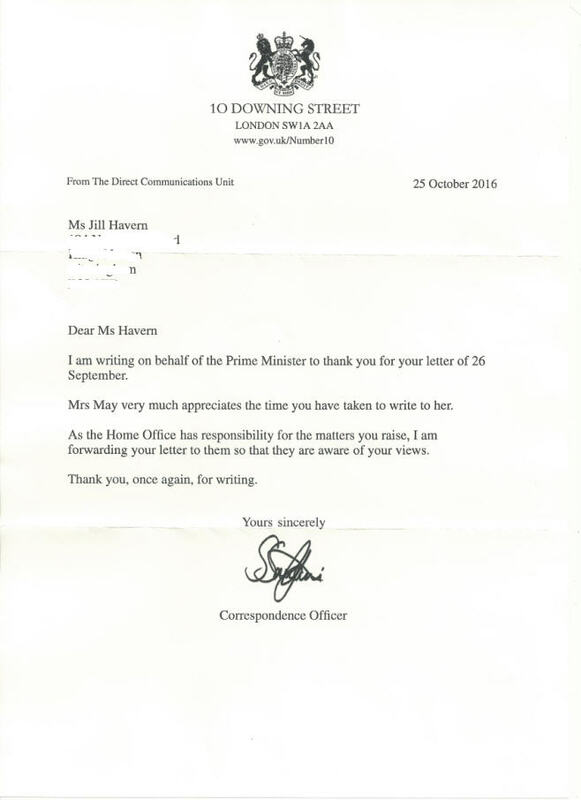 Sir Bernard Hogan-Howe is to step down as commissioner of the Metropolitan police - maybe he didn't fancy replying or discussing your letter with the PM. Cynical as I am, even I expected a bit more than that - it's an utter disgrace. The government believes it is right to do all it can to support the search for Madeleine McCann does it? Why? All the points raised in your excellent epistle have been deliberately ignored. So I ask myself - what will the investigation team have to say? Can't divulge operational detail? They are playing us like a damn fiddle . 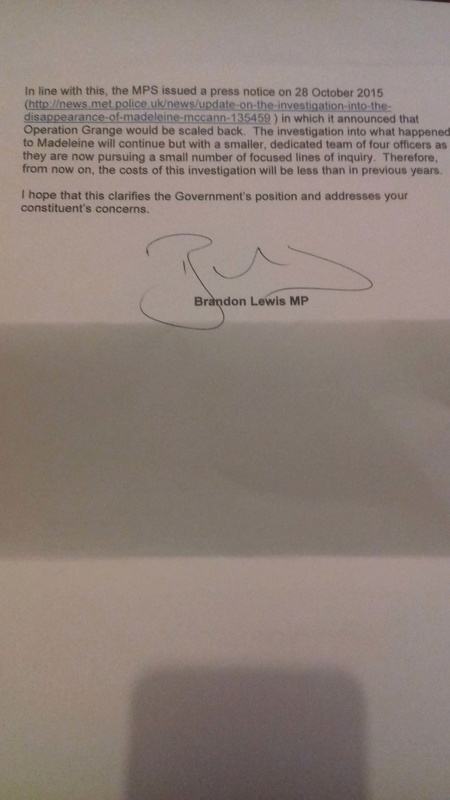 John Smith & Brandon Lewis MP appear to have a similar generic response to the case of Madeleine McCann. Computer generated blurb;sit at desk, locate "make it go away" file, press button, print & post...time for a kit kat? Appalling that these people serve the public! 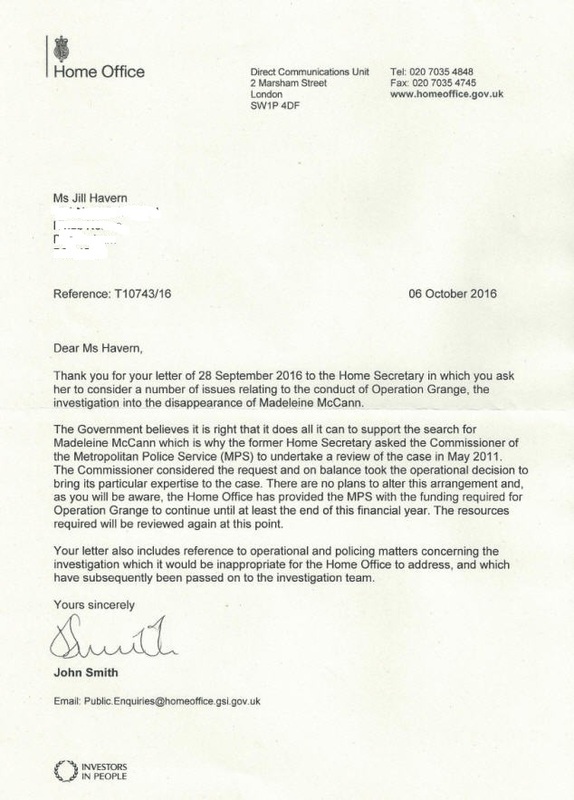 @MayMuse wrote: John Smith & Brandon Lewis MP have a similar generic response to the case of Madeleine McCann. But at least they've passed it to Grange, even though I sent it to DCI Wall anyway. It'll be interesting to see what Theresa May and Sir Bernard say in their 'Go away' letters. And also what they say in response to PeterMac's excellent letter which I can't publish here yet. But I'm thinking of changing my username from Get 'em Gonçalo to Get 'em Peter! Hi GGG,just imagine that your letter could be firmly entrenched amongst the "Parchment papers"in the House of Common's crypt on a D notice? Imagine you asking to see the D notice and having a secret device to take pictures of other"Safely Secured"documents that mysteriously appeared on CMMoM,then You and Tony would be helping the Ravens promotion Tour Business enterprise? Here's the second 'go away' letter from the 'Pass the Parcel' team. Took their time didn't they? A laborious letter like that must take some thought before putting finger to keyboard. Let's wait and see who the Home Office refer it to - Operation Grange or the filing cabinet or the nightwatchman or the rubbish bin? We all know that T. May is promising fairness for one and all. Let's hope this applies to little Maddie and that she gets and deserves a genuine investigation. Is Peter M's letter able to be posted now? He's waiting for his 'go away' letter first plebbers. Thanks GEG. Nothing ever changes (long sigh). @plebgate wrote: Thanks GEG. Nothing ever changes (long sigh). It'll be interesting to see what sort of 'sod off' letter I get from Sir Bernard Hogan-Howe. So my letter to the Home Office went to Operation Grange. 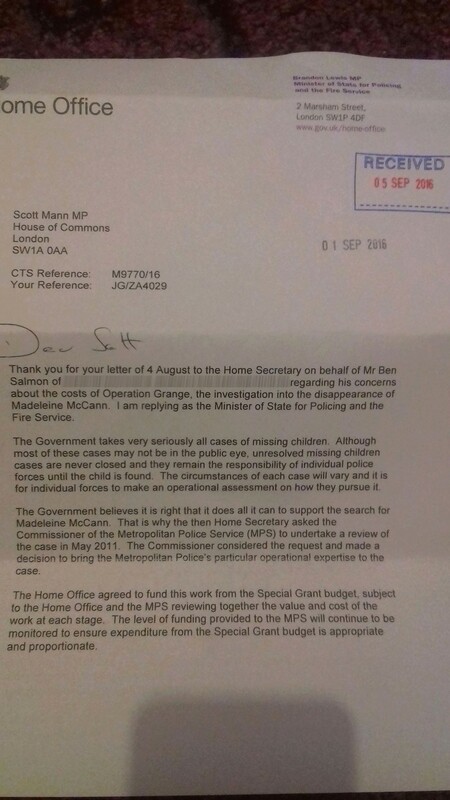 My letter to the Prime Minister went to the Home Office who will send it to Operation Grange. DCI Nicola 'I nick 'em so fast (unless their name is McCann)' Wall will be busy with the shredder. Mrs May has done another U Turn,Heath Row Runway? Tory Blair now thinks he can partake again in resolving"Brexit"aka Ireland not voting the,"Right Way"make them Vote again until we have our decision made,did you advise the PLP members to abstain from voting in the Commons on the"Yemen" and supplying of Arms to Saudia Arabia responsible for Bombing the Yemen people? Tony and George could choose to wear their Bright Orange fashion wear,to go with their Tans in Quantanimo,with some special Water Sports,along with Richard,Donald and fellow cohorts? However, on this 'occasion', our 'unelected' PM will not be able to 'claim' that she could not 'act/interfere' based on 'suspicion, rumour or hearsay'. Her Downing Street 'office' and the Home Office has 'it' in writing'! These are the "people" we are to trust to do right for the citizens of the UK, (debatable) they cannot even mention the "child's" name which millions of the general public are concerned about. Says it all in my opinion.